DAVE KANE: “In 2003, a fire erupted in a Rhode Island nightclub called The Station claiming 100 lives. The youngest victim was an 18-year-old actor, writer and musician named Nicholas O’Neill, known as Nicky. Following Nicky’s tragic passing, a string of messages, signs and signals from the other side began flowing into the lives of those who loved and survived him. Subsequently, a documentary and book have been made to tell his story. Bob Olson, Afterlife TV: Hi, everybody. Bob Olson here with Afterlife TV. You can find us at afterlifetv.com. This is where we search for evidence of life after death and ask the meaningful questions around that subject. Today we’re going to be talking, specifically, about signs from spirit. People who we love and have lost and they’re now in the spirit world; what kind of signs are they sending us? We’ve talked about this subject before and we will again in the future. I think it’s a really important subject that we cover over and over and over. Every story that we talk about is going to be different and extraordinary in its own way. I think it’s important for our audience; so many have lost loved ones, some of them feel as if they haven’t heard from their loved ones. So, for those people, I really want these video conversations to sort of help them get ideas, to create awareness around what to look for as far as the signs and the signals that their loved ones might be sending them. I do believe that our loved ones are always trying to send us messages that they’re okay, that they’re with us. Today’s story is quite extraordinary. This a man who has lost his 18-year-old son, and what happened prior to his death and following his death is really quite amazing. His name is Dave Kane. He is the author of this book, 41 Signs of Hope. We’re going to talk about that in a moment. His son’s story is also in this documentary, which is mind-blowing. I’ve watched it for the second time last night. It will put you to tears many times. A lot of love, a lot of amazing things happening there. Welcome, Dave. Thanks for joining us at Afterlife TV. I appreciate it. Dave Kane: Hi, Bob. Thank you very much for inviting me. I’m thrilled to be here, really. Dave Kane: Oh, I’m old, I’m old. Bob Olson, Afterlife TV: You’re used to doing this sort of thing. This is not new to you, right? Dave Kane: No. I started in broadcasting when I was 15, so, I did it for a long time. I just recently retired from broadcast, but I’m doing other things. It really has helped me to tell this story and I realize now that all the time that I thought that I was being trained to be Morton Downey, Jr. or somebody else – Larry King – I was really being trained to tell this story. I was really being prepared to get this word out to everybody. A very important word, that nobody goes anywhere. That they’re with us, that they love us. They want us to know it and they want us to stop being afraid because there’s nothing to be afraid of. 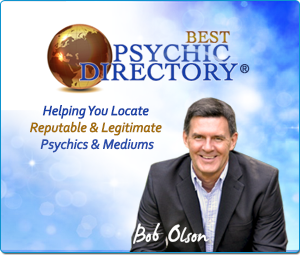 Bob Olson, Afterlife TV: Those are important messages, right off the bat there. I do want to say, we have a lot of audience members who’ve lost loved ones. A lot of people who’ve had extraordinary stories themselves. I want those people to recognize that we’re doing this, we’re having this conversation in honor of them, in honor of their stories, so that they can relate and say, “Yes, yes, yes. That’s just like my story.” That’s part of it. So, it’s not just teaching those who haven’t heard from their loved ones yet or haven’t recognized the signs and the signals, but it’s also for those who have and who want to tell their stories as well, but you’re kind of doing that for them. Don’t you think? Bob Olson, Afterlife TV: That’s right. Bob Olson, Afterlife TV: That’s very typical. That’s classic, it’s classic, it really is. Yeah, you’re right and that’s life, right? That’s life. All right, tell me a little bit about where this all started. I know it was in 2003, correct. A very famous story actually. Dave Kane: Yeah, I think he was the youngest victim of The Station nightclub fire. It was the fourth-largest nightclub fire in the country’s history. One hundred people died, 200 people seriously injured, and Nicky was the youngest victim. The name, 41 Signs of Hope, and the number 41 comes, of course, from Nicky. Before Nicky passed, he would get in the car with me and he’d say, “Dad, look, it’s 2:41,” or he’d see a license plate, “Dad! 41, 41!,” and we never knew what this was. We didn’t know why he felt about this number the way he did. We couldn’t figure it out. His brother, Chris, helped him. We went to numerology and we couldn’t figure it out. Well, when Nicky passed, it he was 18 and 23 days (41). The Station Night Club is at latitude 41.41″. The fire call box at The Station is 4414, and on the cover of the book, as you know, is a sketch of Nicky from a videotape we found the year after he passed. In the videotape, his mom is holding him. He’s about four months old and he’s got a little baseball uniform on and the number on the cap is 41. It began there. We started to get signs. We just talked about coincidences when we started. At first, you look at them as coincidences. You know, “Boy, this was weird and that’s weird and look at this,” and then they started to pile and pile and pile and I couldn’t ignore them anymore. I mean – I say ignore them. I couldn’t just say, “Oh, isn’t that interesting,” and walk away. You have to now stop and say, “Wait a minute. How does this happen? How can this be?” As you see in the book, it as they piled up – you know, this is what’s a big selling point to what we’re trying to tell – is that you couldn’t possibly make this happen by mistake. There are too many coincidences. Bob Olson, Afterlife TV: It was amazing, when you were talking about how they piled up. The filmmakers do a really great job. One of them is your son. Christian and Christian, right? Bob Olson, Afterlife TV: Oh, okay. All right. They do a great job where they’re talking about how these 41’s have just been piling up with lots of people, and they have all these people on the screen and they’re just all sort of telling their stories at the same time. It really give you the sense of how this didn’t just affect one or two or three family members. It extended out to the extended family, friends, maybe even people who were just acquaintances. People are starting to see the number 41 everywhere. Dave Kane: Yes, and I have total strangers writing to me after reading the book and telling me things that have happened, the connections that they’ve gotten, and how they know that Nicky has helped their child come through to them, etc. It’s amazing. In 41 – and the part of 41 that I like, and that impresses me the most is at the end when you realize what Christian de Rezendes, who was a young man we didn’t know before Nicky passed; he’s the co-producer and cinematographer. He realized that he had a significance of 41 in his life from when he was a kid that he didn’t even realize. So this goes back way before we even knew this guy. It’s astounding. Bob Olson, Afterlife TV: Well, you know, numbers are an interesting thing, when you really start to look into numbers. I mean, even when you look into classical music and stuff, the numbers that are evolved are pretty powerful when you get to know what it’s all about. This same thing, you follow a significant number like this, and for Christian to be able to walk into the story, and then look into his past and recognize that that also played a significant part in his life, long before he even knew anything about Nick, it’s interesting and it’s eerie, almost. It makes you think twice. Tell us some of the really significant ways that this number, 41, showed up in your life or someone else’s life after Nick passed. Dave Kane: Well, it goes on and on and on. I mean, there are so many. Some of them, very different. My wife, one day, was driving down the street and they had one of those portable radar detectors showing everybody how fast they were going, you know, and she was right behind a car. The car went by, it said 26 miles per hour. My wife went by and it went to 41. I mean these are the kinds of things that happen all the time. Things happen at 41 after the hour all the time. We don’t even realize that it’s going on until after you go, “Oh my God, it was just…” It just keeps going. I will tell you one of the incidences that happened that is not around a 41, because there are other things that happened too. There’s feather, there’s music, there’s all kinds of serendipity that happens. This is one that I think is important for people to hear. It’s one of my favorite stories. My wife, Joanne, Nicky’s mom, worried terribly that Nicky suffered in the blaze, that the flames got to him and we had a lot of talks about it. Every medium we’ve been to, and we’ve been to plenty. I mean we have done it, and every medium we’ve been to told us the same phrase, “No pain.” They did it over and over again, “No pain.” If we asked, “No pain.” If we didn’t ask, “No pain,” we would be told. Still my wife would get those moments when she worried. We get in the car, she’s driving, and we start going up a hill, and I say to her, “When are you going to get it? This kid has told you. Robert Brown – no pain, Cindy Gilman – no pain, Maureen Hancock – no pain. All of these mediums were telling her – no pain. I said, “What do you want me to do, put it in writing?” As soon as I said that, a car coming from the other direction had the vanity plate NO PAIN. Bob Olson, Afterlife TV: Oh, man. Okay. So, this is what’s cool – because people can, and there are – there are going to be people who watch this if they can get themselves to do it, because they’re cynical, and they’re going to be thinking, “Yeah, yeah, yeah, yeah, yeah, you know, coincidence, coincidence, coincidence.” But you and I use the word coincidence, as many of our audience does, differently than, I think mainstream America. We see it more as serendipity. We see it as, it’s meant to be, and something like that when that happens, it’s kind of really, really hard to deny, is it not? Dave Kane: Well, how do you do it? I mean, this license plate – I chased it, by the way. I got the owner. It was owned by an anesthesiologist, who lives right in the neighborhood. I mean, how does that happen? Would you put any money down that that was going to happen? Of course, you wouldn’t. Bob Olson, Afterlife TV: No way. Dave Kane: Can we talk a little bit about skeptics? I think skeptics are the people that want it to be true the most. I think skeptics are the ones. The reason they’re skeptic is because they’re afraid that it isn’t true. They want it to be. I think that they’re afraid Lucy’s going to move that football. They’re afraid. I call it the Santa Syndrome. My sister is eight years older than I am, and when I was a little boy – I was about four or five – and I said to my sister, “Maureen, but is there really a Santa Claus?” She said, “Really?” and I said, “Yeah.” She said, “No.” I said, “Oh, Maureen!” And she said, “No, no, no, there really is,” and I think that’s what really happens. We want this to be true. We would love for it to be true, but we are so afraid that someone’s going to knock on our door and say, “Surprise!” That’s what keeps skeptics. That’s what skeptics live on. They live on the fear that we’re wrong. 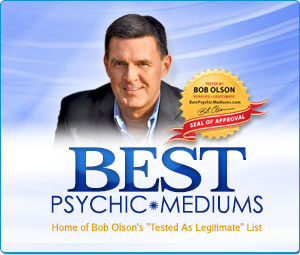 Bob Olson, Afterlife TV: Well, I agree, I mean as a former skeptic myself – and I also attribute it back to being lied to by my parents about these myths. And then finding out later and being very upset by it and thinking – I’m sure these weren’t my words then – but, you know, “I was made the fool; I will never be made the fool again.” So, then what happens is I looked at everything from a distance, was cautious, careful, and before I’d allow myself to believe, I would have to see some evidence on my own. Dave Kane: I do that all the time, even now. I mean, every single occurrence, I stop and I look and I think and I step back to make sure that it isn’t something that I have made up. Bob Olson, Afterlife TV: That’s right . And then the downfall is some people adopt the image of being a skeptic, and once you adopted the image of being a skeptic, you’re now a closed-minded skeptic because you’re looking to prove that it’s not real, rather than being open-minded, looking at the evidence, and then drawing conclusions based on the evidence. So, there’s a big difference there. But, anyways, going past that, let’s talk about some things that people can be skeptical about. Now, I know you say that you saw a bunch of mediums. I saw some of those on the video. Amazing. 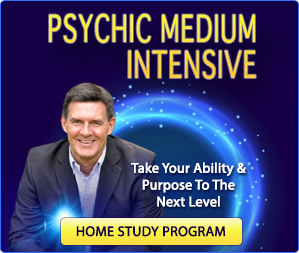 And, a lot of people understand that we can go to mediums and we can get messages but still, is that some of the best evidence that you’ve had? Dave Kane: Well, yes, frankly. Some of them… I mean, there’s a story in the book that I’m sure you’re familiar with. Actually Christian, our oldest boy, gave my wife the book by Robert Brown, We Are Eternal, and it was the only thing that gave her any comfort right after the fire. Reading this book really helped her, and she was in terrible shape after the fire. One night, she was reading it and she was getting tired. She was in bed and she put the book on the floor and put her glasses on the book. The next morning, she got up and looked down to make sure she didn’t step on her glasses and there, on her glasses and the book, was a white feather. From where? How does that happen? So, she said, “That’s it. I’ve got to get a hold of Robert Brown.” So, she wrote to him. His secretary got back to us, surprisingly, pretty quickly; we were shocked, and they gave us his first sitting when he came in from England that year, which was 2003. For an hour, he told us stuff that not only that he did he not know, we didn’t know. After we checked with things that he said happened in the fire, and we went, and exactly where Nicky was standing is where he told us he was standing. We know that Nicky stopped to help people, help one woman. He stopped and tried to help her get up; she was panicking. He told us about that. We found out later that that was correct. But, the biggest one was at the end. When we stood up, he pointed at me and he said, “Your son wants me to tell you one more thing. He wants me to tell you that the show must go on.” What he couldn’t possibly know; what nobody knew, except my wife and I, was that those were the very last words Nicky spoke to me. It was the day before the fire. His band was supposed to open for Great White on Friday night; the fire was on Thursday, so Nicky went on Thursday to check out the room. I thought that he wasn’t getting much money for the gig and I was giving him the father talk, “You know, Nick, show business, gotta get your bucks. I know you like to do this stuff but, you know.” He said, “Yeah, I know.” When we got to his girlfriend’s house; I was driving him, I said, “You know, honey, I didn’t mean to pick on you, but I don’t know why you’d sell God’s talent so short.” He gave me a hug and a kiss and he said, “Dad, ’cause the show must go on,” and he got out of the car. Robert Brown told me those words. Now, in 41, you can see that he says he almost didn’t say it. As a medium, he was afraid that I would jump off the couch and punch him in the face because he thought that I would think he was saying, “Just move on.” So, he was afraid to say it, but my son was screaming at him, “Say it! Say it the way I tell you! Say it!” So, he did. I’ve got to tell you – well one thing I didn’t tell you is four weeks before this, I had open heart surgery and I was not in great shape and I was ill. My wife and I, we had met him in New York. We went to the Stage Door Deli after that and ate like a couple of pigs. I mean we were so elated. We knew that was Nicky. There could be no denying that was Nicky. Bob Olson, Afterlife TV: That’s right. Yeah, and those are the kinds of messages that you really can only get from mediums. It’s really difficult otherwise because, a lot of time, some of the other things that happen, you can say, “Well, maybe it’s just a real coincidence,” you know what I mean? Again, the license plate, NO PAIN. I’m sure that it gave Joanne a lot of solitude to see that but, still, over time, it’s not quite as effective as some medium who knows nothing about Nicky, coming through and giving the last words that he spoke to you, obviously. Dave Kane: Astounding, absolutely astounding. It’s still up there. We have a lot of other stuff too, but, I mean it’s up there. We’ve been to so many different people and frankly, I go in holding back and waiting, you know. There’s a guy here locally who’s a terrific medium, Roland Comtois. Are you familiar with him? Dave Kane: He’s terrific. He does a thing called purple papers, where he writes messages before he even meets you. Sometimes years before he meets you. Then you go and he says, “Wait a minute. I’ve got a paper for you,” and he comes out he’s got this paper and it’s specific to your instance. Well, I went into him locally. You know, I’ve had a lot of press here, locally, so I’m always skeptic when I go. But my wife made the appointment for me under my first name only. I sat down. Bob Olson, Afterlife TV: No way. You’re kidding. Bob Olson, Afterlife TV: Oh right, right. All right, well, since you brought it up – so this is an 18-year-old, probably a 17-year-old, probably, who wrote this play. Dave Kane: Yeah, well, he wrote the play. He also said to his mother one day, “You know, I think I could play the guitar.” They were going by a music store. He said, “I think I can play the guitar.” So, we did the thing parents do. “Okay, we’ll get you a guitar. You’ve got to practice. You’ve got to take lessons. You’ve got to blah, blah, blah…” We did that whole thing. We got him a guitar. He took four lessons and proceeded to write 50 songs. His writings, his poetry; this wonderful play that is so moving. In 41, you see they go back and forth to pieces of this play that is just astounding and we never realized. He had told his mom that he had written something that was for a competition and then we didn’t know whatever happened. We forgot about it. One day, a few weeks I guess after the fire, his friend Emily Kunkel called us and said, “I have Nicky’s play.” She had it in the bottom of her closet under a bunch of shoes or something. She was going to read it, you know. And then when we read it – it’s so moving. And when you know Nick, you know this is really something. Bob Olson, Afterlife TV: Well, this is it. And he’s writing this because he acted in plays his whole life. This was what he did. He was theatrical, he was musical, he was in a band, he expressed himself in this way. It’s not unusual for him to be writing a play, but very unusual for him to be writing a play about they walk among us. Dave Kane: Yes, and when we put it together, when we produced it – his brother Christian, who is a stage director and a videographer, he directed it. His brother Billy came, who is an opera singer, by the way, in San Francisco, he came and sang. His brother David played the part that Nick wrote for himself, the lead, of course. He played Nicky’s part of Cyrus, the angel, and his girlfriend Gabby played Grace, the angel and her brother Alex played the… So, I mean, it was a whole family event. All the people you see in that play were friends or relatives of Nick. Bob Olson, Afterlife TV: It was an incredible tribute of all these people getting together to be part of this play in tribute to him. But, I don’t know, I can’t even imagine what that must have been like. It must have been really emotional just to be going through it. Of course, you guys needed to practice a lot, so there was a lot of… He brought a community together, did he not? Dave Kane: Yeah, he really did. And that’s one of the things, when people talk about losing a child, by the way – this is important to mention, I think – one of the things that has helped us is to understand that Nicky passed this way, at this time for a reason. That there is a reason to all this. If you think that it’s just about a bunch of people who were greedy and jammed a bunch of people into a hellhole, which it did, but what came out of it. You know, if Nicky had died when he was 65, 75, or 85 of old age they would have said, “Oh, I think he wrote a play or something.” By passing at 18, the message that he was trying to give, the 41 message, has much more impact because people sit up and take notice at this young man. Bob Olson, Afterlife TV: I think you touched upon it early on, when you brought up the play, but what is the message of the play? Dave Kane: Well, the play is about a young man who is gay, who is tormented by his life and trying to figure it out; contemplates suicide, etc. These three angels come and step into his life and, primarily, the message is that God loves you no matter what. He loves you no matter what. There is nothing to fear, that everything is fine, that we will be back, we will be angels, we will be spirit. There is nothing to fear and that God loves you no matter what. That’s Nicky’s message. And he was very upset, and as you see in 41, his brother David talks about how Nick could not get over the discrimination toward gay people, etc. It drove him nuts. So, this is one of the things that he wrote about. Bob Olson, Afterlife TV: Now, interesting, Nick, who was not gay. Bob Olson, Afterlife TV: We saw him with his girlfriend, Gabby, throughout the whole documentary, 41. So, here is someone who is relating to something that is going on outside of him. It’s not like you guys – he didn’t live in New York City or something like that, you know what I mean? It’s a small town in Rhode Island, so I don’t know how much of this he could have been seeing but, obviously, what little he might have seen, it bothered him and he spoke about it. Dave Kane: Well, yeah, he spoke about it. He spoke up a lot about a lot of things. He takes after his father a little bit. But when he saw injustice, he stepped in. Whether it’s defending little kids, or whatever it was, he was always like that and still does it. He still does it. Bob Olson, Afterlife TV: He pushed the boundaries a little bit as well, I think, with some of the terminology he used. He wasn’t afraid to just put it out there. He was that kind of a kid, right? Bob Olson, Afterlife TV: You don’t know where a lot of this stuff came from. I think it’s also important – you know, there was a young girl named Grace, right, who passed when she was five and Nick went to sort of console, tried to console her brother, who was what, nine at the time? Dave Kane: Yeah. This was really weird too, because they were in acting at the old Children’s Theater in Rhode Island. Nicky, of course, was older and he befriended Grace’s brother. And when Grace passed – she passed from what Jim Henson had, that disease that just gets you like that – he befriended the little boy and then, a year later, Nicky passed. That was really tough. We did what we could to help the boy get through that because it was terrible for him, and at that age, you know. Bob Olson, Afterlife TV: Wow! Those are wow moments. All right. Do you see this with other people? I know I have. Sometimes, before people pass there seems to be an almost unconscious – not conscious – an unconscious knowing that there is some change that’s going to be taking place, that something is up. I just have to wonder. I know that in the movie they talked about Nick really wanting to look into his past, really wanting to get in touch with people from his past, all of a sudden. In fact, he was pushing to have some type of a reunion of all these people from his past in the near future. Of course, he did have one, but not necessarily in the way that he expected. Have you seen this with other people? Obviously, it’s in his story. Dave Kane: Yeah, I have. My own mother passed and, before she passed, she did things that just didn’t make sense to me. She had a used car and she went out and bought a newer used car. I couldn’t imagine why she did that. She put carpeting in her apartment because she liked the landlords and she spent her money. You know she did all these different things, and she worried constantly that there wouldn’t be enough money to bury her. She wanted to pay for her own burial. You know, she worried. Bob Olson, Afterlife TV: Yeah, it is. It’s cool when you look back. Now, some of the other messages that you’ve got from Nicky tell us a little bit about, maybe, some of the electronic malfunctions. When my father first passed, I was in my 30’s. I think I was 35 years old and I wasn’t into this stuff at all, I had no idea. But a few things happened. I would smell lavender, or whatever. I would smell this odor that reminded me of him all the time. My car would fill up with it. Today, people are a little bit more aware of these things. You certainly had those kinds of electronic malfunctions. You got a story to tell about one of them. Dave Kane: I’ve got a bunch of them. You want me to tell them about the wiper story? Bob Olson, Afterlife TV: Yeah, tell it. Dave Kane: Well, I have a van and I use it for my shows. I still perform and I use it to transport equipment. Shortly after Nicky passed, my windshield wipers started going off all by themselves. You know, if I had his music on or if I was talking to him, or as I was thinking about him, you know, the windshield wipers [sound effects]. Well, one day, I was buying some props and my change was 41 cents. Now, this is one of those coincidences that you can go, “Oh, isn’t that cute,” and put it in your pocket. What I do, of course, and what our family does is, “I know that’s you, Nick. Thank you, Sweetheart. Thank you, I know that’s you.” So, I get in the car and my windshield wiper goes [sound effect]. “Okay, Nick, I know that’s you.” I’m going down Main Street, sunny day, beautiful, my wipers are going off. So, I pull into Kentucky Fried Chicken, I get out, I go get a sandwich, I come back in, start the car again, and again the wipers. So, out loud I say – there’s nobody in the car, just myself and Nick – “Jeez, this kid won’t get off my back today,” and, as soon as I said that I turn back, like this, to back up, and my rear windshield wiper went [sound effect]. Bob Olson, Afterlife TV: Those are whoa moments, no question about it. Dave Kane: There’s so many of them. But I want to encourage people to know that they will get stuff that may not be this big because this is Nicky’s job, I think. But the little things. You know, you’re driving to the supermarket and you’re thinking about your Aunt Tillie and you walk in and her favorite song is playing on the Muzak. That’s your Aunt Tillie saying, “Peek-a-boo. I’m thinking of you too.” They’re little things and, the more you acknowledge them, the more you get. Bob Olson, Afterlife TV: That’s my point, you know. So, you might have an Aunt – I have an Aunt Stella. A lot quieter than Nick was in life, and so her messages might just come through a little more subtly. So, we can look for those that way. I think sometimes they have to look for the signs that might be related to their personality in some way, you know what I mean? If the person was an accountant, numbers might be an important thing. If the person was interested in art, art might be a way that you’re looking. If they were a bird watcher, certainly watch for the birds to show up at your window and stare at you in the eye; those sorts of things. Now, there was another electronic malfunction. Talk about the music box. At least tell us that one. Dave Kane: That was really very interesting. That story starts with Nicky – Chris and his now wife Leah, were at the house and Nicky was sitting with them playing his guitar. They wanted to go to sleep and he wouldn’t let them. He was playing, and he said to Chris, “Let’s sing songs from that great, old musical, Carousel.” And then he decided to sing songs but, of course, Nicky, he wrote songs, and he ad-libbed. These songs had nothing to do with Carousel. They were insults of his family and friends. So, that was it. And after, Nicky said to Chris, “I don’t know why I said Carousel, because I don’t even know what Carousel is about.” Carousel is a musical about a young man who passes and comes back to watch over his family. You know, Chris is in theater, he produces stuff, he directs stuff. He says, “Who plays Carousel? This is 2003.” So, he’s walking around and they’re playing music and he finds a beautiful music box that plays a song from Carousel. So, he thinks this is the perfect gift. It’s one of those little, hand-wound things, you know. He brings it home. Of course, on Mother’s Day, he gives it to his mom. We listen to it. It’s lovely. We put it on the counter where Nicky’s pictures are and forgot about it. That night, Chris starts yelling, “Mom, Mom come here, come here, come here, quick!” I was in the bedroom with my wife just talking. We run in, and the music box started to play at 9:41 and it stopped at 9:42. Bob Olson, Afterlife TV: No kidding. Oh man! Bob Olson, Afterlife TV: And to add to the 9:41 part, in the documentary, there’s even footage of him talking about 41, but also saying “9:41,” somehow 9:41. Dave Kane: Well again, let me sneak one in here on you. Disney World. Nicky loved Disney World and the January after Nick passed, we went to Disney World. There was nine of us in the group that went. We were going to go to Hoop De Doo Revue. Nicky loved Hoop De Doo Revue. So, we’re all getting on the boat and we’re going over to the island and, just as we get there, my wife says, out loud, “Okay, Nick, here we go, Hoop De Doo Revue,” and every light on the dock went off and went back on. Bob Olson, Afterlife TV: They’re just piling up on you. Just, boom, boom, boom, boom. And, again, see, a lot of people, this might happen to them and they just might not notice it, you know. They might not care what number table they got. They might not think about that. They might not notice what this little boy’s name is. So, some of these things, people are getting these messages but they’re just too busy with life and they’re missing out on them. The point of having these kinds of conversations and other people listening to them is because I think they’re important and they are helpful. You’ve also had some interesting things with electronic voice phenomenon. It’s not my thing, in that I haven’t done a lot of research on it. The ones that I’ve heard, you know, I’ve seen a lot of them on TV and stuff and the tell you what they’re saying. When I first hear it, I don’t hear anything. When you tell me what they’re saying, okay, now it makes sense. Dave Kane: I should send you one of Nick’s. Bob Olson, Afterlife TV: Right. But, at the same time, I’ve seen too much in this field to think that that is impossible. I do believe that it is possible. You had some interesting things. I saw one in the documentary where Maureen Hancock was part of. Dave Kane: Well, that’s interesting because the Maureen Hancock one was she tells Joanne that she’s going to hear Nicky call to her and, on the tape, at that moment, you hear a little boy’s voice say, “Mommy?” Because we have so much videotape on Nicky, we can find a time in his life when the voice matches, you know. That is good but wait until you hear this one. Now, like you said about the EVP’s, they’re very tough to make out. I analogize it when I talk about it like those pictures with all the colored dots and you’re supposed to be able to see the submarine. I can never see the foolish thing. So, you hear them, and they’re kind of muffled. So, she sent us a couple from Nick that we really couldn’t make out and I was really disappointed. Then one Sunday, I get up. I get up before my wife and I go online and, in my email, she has sent me another EVP, and I’m going to send it to you, Bob, because I’d like you to hear it. But, in this EVP, you hear what is absolutely Nicky’s voice. It is no doubt that it’s Nicky’s voice, as an adult, and he is saying, clear as day, “Mom and Dad, this is Nick.” It sounds a little bit like a short-wave radio. “Mom and Dad, this is Nick,” but it is him. I sobbed and sobbed when I heard this. I couldn’t believe how real this was and I couldn’t wait for my wife to wake up. I didn’t want to wake her up because I wanted her to be wide awake to hear it, but this is astounding, and even people who do this all the time are shocked at how clear this is. Dave Kane: Yeah, we took out some of the ambient noise, and cleaned it up but, not much, because this one was really good. Bob Olson, Afterlife TV: Now how would you put all that together? Why this woman? Would it be because this is the woman who’s out there recording these things? Dave Kane: It could be. I don’t know. Nicky brings people to us that we never knew. He touched the life of John Land, the author who took Nicky’s play and has made it a feature-length motion picture now, and we’re attempting to get that made. He’s brought all these mediums to us; the right ones. I say the right ones because they’ve been able to connect and relate to Nick in such a way. Everybody’s different. You know there are good mediums or good aluminum-siding salesmen. You know, everybody’s different. He has brought us people – a woman I told you before we started about a woman in Bulgaria, who’s a television personality in Bulgaria who contacted me with this stuff. He brings people to us. We have people from Scotland contacting us. All over the world, we have people who are being touched by this story and it is really astounding. I’ll tell you a quick one. Are you familiar with Susan Apollon? Bob Olson, Afterlife TV: No. Dave Kane: Susan Apollon is an intuitive and a psychologist and she was a co-author of Life After Life. The follow-up to Life After Life. Bob Olson, Afterlife TV: Oh, okay. Dave Kane: I’ve had her on the air a few times with me and we got to be friends. She had a couple that was coming to her for psychological help because the son passed away and the father thought he was getting signs from the son. So, she said to them, “Well, you got to contact my friend, Dave Kane and his wife Joanne because they get it.” But the guy never contacted me. So, here’s Nicky, chiming into that session to let them know that their boy is okay and it’s so, really odd. Now, the punch line to this is that this father finally did call and we had a long talk. His name is Eric Stark. I told Joanne about it after I had the conversation and she said, “Isn’t that weird?” She said, “This morning I thought about Anya. My wife used to have a daycare and little Anya was one of the kids. I used to say to her, “Don’t get any Anya,” you know. Her last name is Stark, and she was dreaming about her just before she woke up that day, and then we found out that her father’s name – I remembered her father’s name is Eric. So, she dreamt about Anya Stark, whose father’s name is Eric, and this guy calls me, Eric Stark. That’s Nicky letting us know he was involved in this; taking credit for it. Bob Olson, Afterlife TV: That’s right. See what I can do. Well this is it, and like you say, the stories go on and on. It’s difficult to, obviously, fit them all in into one interview, which is why you have these things. So, you have your book, 41 Signs of Hope. 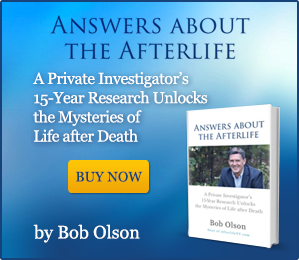 Bob Olson, Afterlife TV: How can people get this book? Dave Kane: Go to www.41signsofhope.com. Just contact me and we’ll set them up. 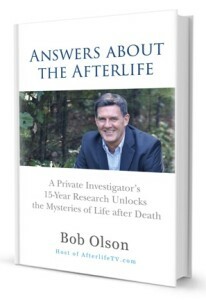 Bob Olson, Afterlife TV: It’s hard to believe that you didn’t plan 41 chapters. Dave Kane: No. My publisher, at the time, wrote to me and told me that and I said, “No one is going to believe that. No one’s going to believe it,” but he was so impressed with it that he went with it. Bob Olson, Afterlife TV: And he wrote it at the beginning. You have a lot of integrity and I believe that is true. Here’s a great picture of Nick. A wonderful picture of Nick. Dave Kane: Thank you. Thank you. Bob Olson, Afterlife TV: Handsome. All your boys are handsome. Dave Kane: Yeah, you can get that at www.41themovie.com. Bob Olson, Afterlife TV: So www.41themovie.com. Can you buy a DVD or how does that work? Dave Kane: Well, it’s on Netflix. You can get it on Netflix too. Dave Kane: So check it out on Netflix, or you can purchase the DVD. Bob Olson, Afterlife TV: Well, that’s beautiful. The play, you say it’s not ready yet. Did Christian de Rezendes film it himself? Dave Kane: Yeah, what you see in 41 is clips that we had. He shot it. It is available on CD, also. You can check with Christian on that. It’s also available on DVD, excuse me. But the play we’re doing something now and we’ve been trying to present it again for the 10th anniversary of the fire. The play has also been re-written. I say re-written; our friend, John Land, who we met after Nicky passed. He never knew Nick, but who will that you that Nicky helps to write and to expand this play to a feature-length motion picture. On another side-story, when he sent us the first draft of his presentation, he had to add a bunch of characters. Every name of every character he added was somebody in Nicky’s life, that John had no idea. When he first looked at it he said, “Oh my God. Look at this, all of these people their names are significant people to Nick.” So, he’s always felt that Nicky helped him write the play. Bob Olson, Afterlife TV: That’s right. To me, it’s just like, of course, of course. Of course that’s the way it was, right. Dave Kane: Yeah, of course. Bob Olson, Afterlife TV: So I think we’ve covered all the websites. Any final advice or message that you have for people in any way, but maybe people who haven’t seen any signs, you know? Dave Kane: The best thing I can say is anybody who wants to talk to me, anybody who wants to contact me, it’s very simple. Go to www.41signsofhope.com. All my contact information is there. My email, my phone; I will talk to anybody at any time, it doesn’t matter. I want people to know that their loved ones are with them. I want them to know that sometimes they’re missing it. You know, they’re just so busy being crushed and sorrowful, yet they don’t realize somebody’s standing there holding a glass of water for them. You know, it’s okay. So, please, I want everybody to know anything that I can do to help them know that they’re loved ones are with them, that’s what I have to do now. That’s my gig now. Bob Olson, Afterlife TV: Really. Dave Kane: Yeah, and I really want them to know that our family is here to help them in any way and speak to them. My wife will certainly talk to anybody to help them. Any mother who’s lost someone. And just have faith. Do not fear to hope. In Nicky’s play, one of the lines the angel, Grace, says to the young man having problems, “Do not fear hope.” So, we put that on Nicky’s gravestone and that’s what he wants you to do. He wants you to know that there’s nothing to fear, that your loved ones are fine, and you are going to be fine. Bob Olson, Afterlife TV: That’s beautiful. That’s beautiful. Well, thank you for that. Thank you for the offer that you sent out to people. I’m sure a lot of people are going to take you up on it. Bob Olson, Afterlife TV: What a gift that is. I appreciate it. It was wonderful having you on, and I do recommend that people get the documentary, the book. 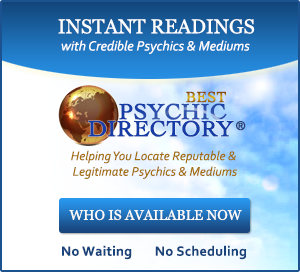 If this is a subject that interests them and they want to learn more about to find new ways that they can connect with their loved ones in spirit. Maybe we’ll talk to you again in the future, when that play is going to be nationwide, huh? Dave Kane: Right. Yeah. Wouldn’t that be terrific? Bob Olson, Afterlife TV: Yeah, that would be wonderful. I wish you the best. Thanks so much. Dave Kane: Thank you so much, Bob. Bob Olson, Afterlife TV: All right, bye.